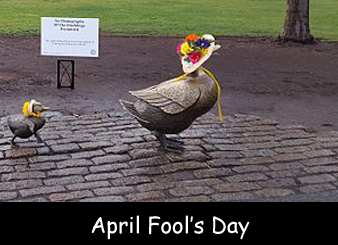 April fool’s Day is celebrated every year on April 1. People celebrate it across the world by playing pranks on each other. There are so many interesting events and stories which are associated with this day. This day is called ‘Poisson d’Avril’ or ‘April Fish’ in France. In France, children sometimes stick a picture of a fish on the back of their schoolmates. This day is known by several other names around the world including April Noddy Day, Gowkie Day, Huntigowk Day and St. All-Fools Morn. Pranks played on April fool’s day are meant to be fun and totally harmless. In Scotland, April fool’s day is a two day event and the second day is known as ‘Taily Day’. In some countries, people throw flour at each other as a part of the festivities. In 2008, BBC played a prank by running a video clip of flying penguins. Although this day has been celebrated for a long time the origin still remains a mystery. This day is also linked to the ancient Roman festival of Hilaria. In Canada and England, the pranks are supposed to be played until noon only. Google actually launched Gmail on the eve of April fool’s day and everyone took it as a prank. The Korean royal family is allowed to lie and play pranks on this day. On April 1, 1945, when the weather broadcast department announced a tsunami in Pacific Island, people didn’t take it seriously. Declan, Tobin. " Fun Facts about April Fool's Day ." Easy Science for Kids, Apr 2019. Web. 25 Apr 2019. < https://easyscienceforkids.com/april-fools-day/ >.